Aims: To analyse the feasibility of laparoscopic radical nephrectomy (LRN) for renal tumours >7 cm and to compare the operative and oncologic outcomes with open radical nephrectomy (ORN). Settings and Design: This was a prospective, observational, comparative study. Subjects and Methods: The study was conducted at a tertiary care super-speciality hospital. 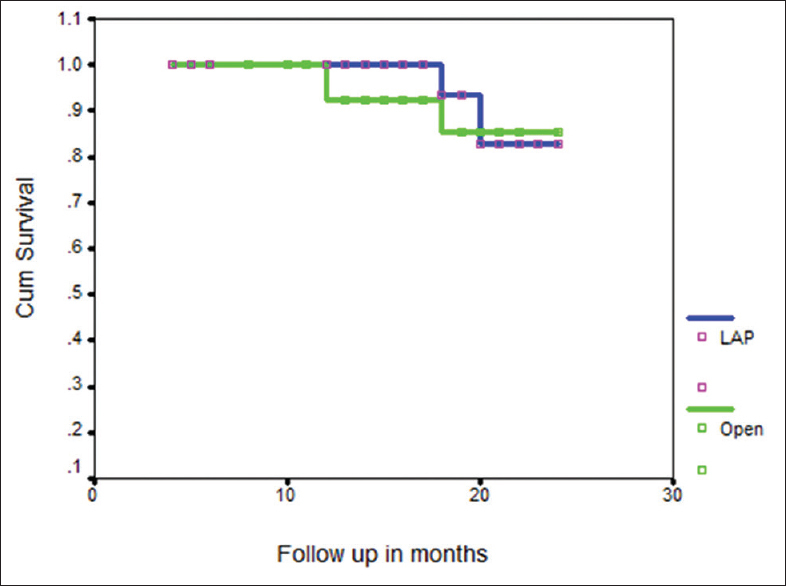 All the patients who underwent radical nephrectomy for >7 cm renal tumours during a period of 2 years (April 2012 to May 2014) were included in the study. Thirty patients were included in each ORN and LRN group. Pre-operative, intra-operative and post-operative data for all these patients were collected and analysed. Statistical Analysis Used: Statistical Package for the Social Sciences (SPSS, version 11.0 for Windows, Chicago, IL). Conclusions: LRN for large renal tumours is feasible and achieves oncologic outcomes similar to that obtained with ORN. Results are summarised in [Table 1] and [Table 2]. Intra-operative complications [Table 2] were similar in both the groups. One patient in each group had intra-operative haemorrhage which was managed with required intervention and did not required conversion in LRN group. One patient in each group had serosal bowel injury, which was treated with suturing. Recurrence-free survival [Figure 1] was 90% in patients who underwent ORN and 93.3% in patients who underwent LRN (P = 0.630). There was no statistically significant difference in recurrence-free survival between two groups. Subotic S, Wyler S, Bachmann A. Surgical treatment of localized renal cancer. Eur Urol 2012;11:60-5. Campbell SC, Lane BR. Malignant renal tumors. In: Wein AJ, Kavoussi LR, Novick AC, Partin AW, Peter CA, editors. Campbell-Walsh Urology. 10th ed. Philadelphia: Saunders Elsevier; 2012. p. 1420. Clayman RV, Kavoussi LR, Soper NJ, Dierks SM, Meretyk S, Darcy MD, et al. Laparoscopic nephrectomy: Initial case report. J Urol 1991;146:278-82. Steinberg AP, Finelli A, Desai MM, Abreu SC, Ramani AP, Spaliviero M, et al. Laparoscopic radical nephrectomy for large (greater than 7 cm, T2) renal tumors. J Urol 2004;172:2172-6. Ganpule AP, Sharma R, Thimmegowda M, Veeramani M, Desai MR. Laparoscopic radical nephrectomy versus open radical nephrectomy in T1-T3 renal tumors: An outcome analysis. Indian J Urol 2008;24:39-43. Hemal AK, Kumar A, Kumar R, Wadhwa P, Seth A, Gupta NP, et al. Laparoscopic versus open radical nephrectomy for large renal tumors: A long-term prospective comparison. J Urol 2007;177:862-6. Jeon SH, Kwon TG, Rha KH, Sung GT, Lee W, Lim JS, et al. Comparison of laparoscopic versus open radical nephrectomy for large renal tumors: A retrospective analysis of multi-center results. BJU Int 2011;107:817-21. Ritchie RW, Sullivan ME, Jones A. Laparoscopic radical nephrectomy for T2 renal cell carcinoma. Br J Med Surg Urol 2009;2:117-23. Kwon SY, Jung JW, Kim BS, Kim TH, Yoo ES, Kwon TG, et al. Laparoscopic versus open radical nephrectomy in T2 renal cell carcinoma: Long-term oncologic outcomes. Korean J Urol 2011;52:474-8.